While the debate over electric motorcycles as the future of two-wheeled mobility still simmers, BMW is already thinking ahead unveiling their most recent project dubbed “Ghost Rider.” A fully self-driving BMW R1200GS controlled only by the algorithms inside its computer. The German manufacturer surprised journalists last weekend with a live demonstration of the experimental self-driving BMW R1200GS at a track. 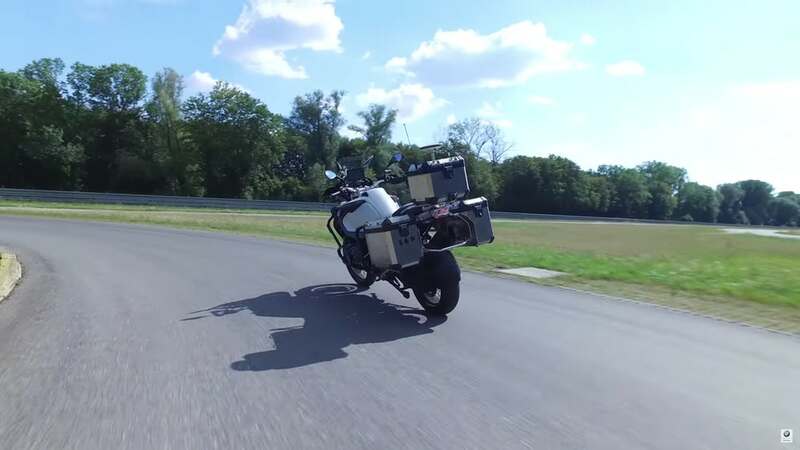 As if guided by magic, the autonomous motorcycle doesn’t require a rider to navigate and can move itself freely with no aids, going around corners and even stopping without falling to its side. According to BMW, the aim of the technology is not fully-automated motorcycling but the extension and refinement of driver assistance systems. “For example, less experienced drivers could be assisted by the electronics to avoid dangerous spots or to avoid them in a timely and targeted manner,” explains BMW. The potential of the technology is vast as a safety system, decreasing the probability of a collision or intervening in a slide among other scenarios. It’s worth noting that BMW isn’t the only brand working on autonomous two-wheeled vehicles. Yamaha has already shown what they can do with their “MotoBot” — a motorcycle-riding humanoid robot that raced Valentino Rossi on a track. And Honda has unveiled a motorcycle that is able to follow its owner as well. Nevertheless, the self-driving BMW R1200GS is an impressive show of technology by the German marque and an exciting sneak peek into what is possible in the future.